Media note: The robot used to disarm the suspect will be available for viewing. The Los Angeles County District Attorney’s Office has filed multiple charges against, 52-year-old Ray B. Bunge, of Lancaster. He is the gunman who was disarmed by a robot operated by a Los Angeles County Sheriff’s Department Special Weapons Team on Thursday, September 8, 2016. He has been charged with: Attempted Murder; Criminal Threats; Assault with a Deadly Weapon, a Firearm; Robbery and Felony Vandalism. In the late evening hours of Thursday, September 8, 2016, Lancaster Station deputies pursued a gunman suspected of Attempted Murder and several other crimes in Lancaster. In an effort to apprehend the suspect, a foot pursuit was initiated. The suspect fled into a dark open field where deputies lost sight of him. An LASD Aero Bureau helicopter responded and located the suspect from the air. 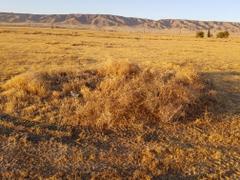 He hid in a small dugout dirt berm with shrubs and fencing wire around him. Aero Bureau also observed the suspect was armed with a firearm. Air and ground units used their public address systems to order the armed suspect to surrender; he refused. A Special Weapons Team was called in to assist Lancaster Station deputies with the incident. For over a six hour period the Special Weapons Team made multiple requests for the suspect to surrender in an effort to safely resolve the incident. The suspect continued to refuse. A plan to disarm the suspect was devised by the Special Weapons Team. Team members inside protective armored vehicles approached suspect’s concealed position and used the vehicle public address systems to again order the suspect to surrender. 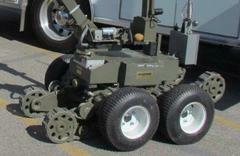 While his attention was focused on the vehicles in front of him, the Team deployed a robot from behind the suspect’s position. The robot quietly approached the suspect’s position. 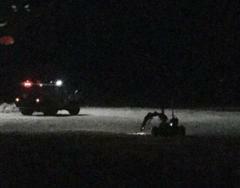 Through the robot’s camera the suspect could be viewed lying on his stomach looking towards the SWAT vehicles. His gun was observed next to his feet and the robot quickly picked up the weapon without him noticing. The weapon was immediately delivered to SWAT personnel. The robot returned to the suspect’s position and pulled the fence wiring away from his position. He looked up and realized his gun was gone and he was exposed. The suspect surrendered to the Team without incident. The Los Angeles County Sheriff’s Department is committed to resolving all incidents in a manner safest to the public, Department members, and to those arrested. Technology is always being tested and used to be more efficient and to provide improved public safety. 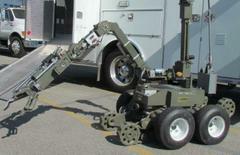 This incident is one, of very few known, where a remotely operated robot was used to successfully disarm a gunman. Although this method cannot be used in every incident, the use of robot technology in this instance has proven the safety of all involved. For further information contact, Public Information Officer Nicole Nishida, (323) 810-1973 or Sheriff’s Information Bureau, (213) 229-1700.